Anyone who knows me, knows I absolutely love the summer time. Yes I was named after it & it really does fit me to a T! Along with summer time comes summer essentials. Physicians Formula Butter Bronzer - Holy crap this bronzer smells amazing! It's like being on a coconut beach and I love it! The color is awesome, blends extremely well, and just makes my morning smell amazing! Aussie 3 Minute Miracle - Die Hard fan here. Seriously have been using this deep conditioner for years and years. It makes my hair so soft & I bring 2 bottles of it when we go to the beach. One for me & one for Bella. 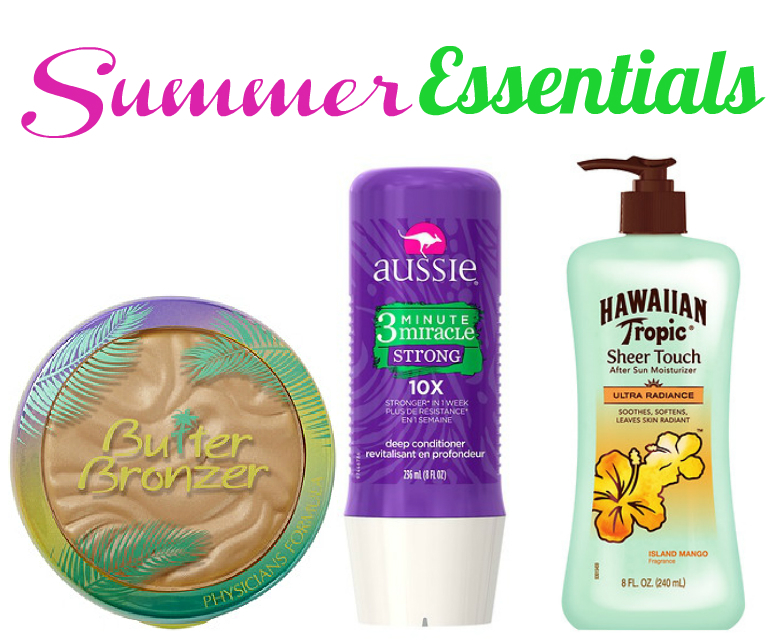 It gets our hair so soft after sun & salt water, it's a must for all summer long! Hawaiian Tropic Sheer Touch - This is my absolute favorite lotion for after being in the sun all day. It smells heavenly & really helps with sunburns. It has a great cooling effect and I use it even when I haven't been out in the sun all day!